Today, the G-League hosts, Gamefy, announced on their Weibo account some details regarding the upcoming Grand Finals in Shanghai. 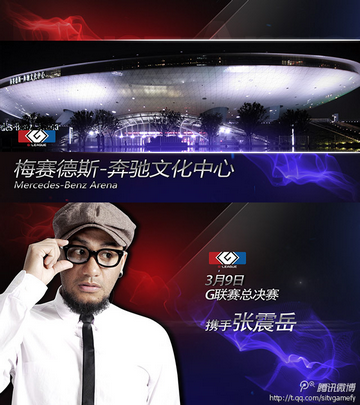 It will take place on March 9, 2013, with the location being the previously revealed Mercedes-Benz Center! Additionally, they have revealed that these Grand Finals will be held in a different way than typically expected of these events, and will feature mainstream celebrities: they have confirmed that popular Taiwanese rockstar, Zhang Zhenyue (张震岳) will be present. On top of that, there are many more as-yet unannounced VIPs to make appearances at the event. Perhaps we’ll even get to see the “real or fake” Jam Hsiao act again too. Pingback: Dotaland weekly recap: Jan 9 — 15, 2013 « Dota 2 CN — Dotaland! Pingback: G-League Finals to feature MC HotDog « Dota 2 CN — Dotaland!